"Australia Liberalizes Export Laws for Indigenous Art & Antiques"
The end of 2018 brought good news for collectors of Australian art. New regulations implemented under the Protection of Movable Cultural Heritage Act 1986 (PMCH 1986) will ease export restrictions on the Australian art trade, particularly for the works of indigenous artisans. The previous regulations have been in place with some amendments since 1987 and were due to sunset in April of 2019. Aboriginal shields at the Ian Potter Centre: NGV Australia, Federation Square, Melbourne, Author: Travis from Sydney, NSW, Australia, Wikimedia Commons. Davidson explained that because the previous regulations, dating to 1987, required export permits for artworks over 20 years of age and AUD $20,000 in value, foreign buyers, whether collectors or museums, were discouraged – not knowing if an export permit would be granted. Also, as time passed, more and more artworks made for sale by contemporary aboriginal artists came under the 1986 Act. 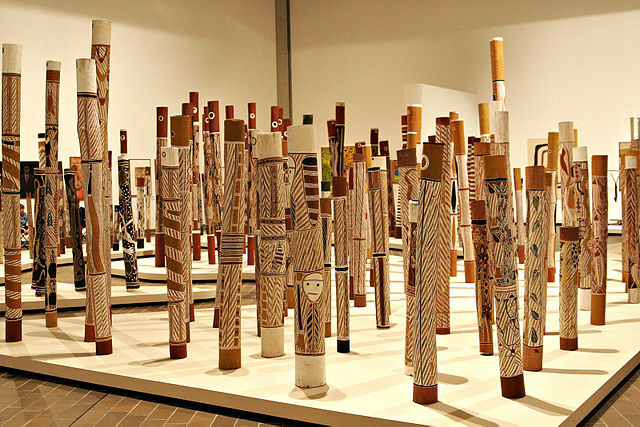 There are more restrictions on export of Pre‑1901 Aboriginal or Torres Strait Islander artworks and Pre‑1960 Aboriginal or Torres Strait Islander bark paintings or sculptures, both of which require an export permit if their value is over AUD $25,000 (the previous value limit was AUD $10,000). Aboriginal desert paintings (including pre‑1974 Aboriginal Papunya paintings) and Aboriginal Kimberley paintings on canvas will now require export permits only if valued over AUD $100,000. While the value thresholds for unrestricted export of these Aboriginal paintings are still far lower than non-Aboriginal oils and acrylics (threshold set at AUD $350,000) the amended regulations mark a step forward toward equal treatment with other Australian artworks. The amended regulations mean that while the most important and valued objects will still receive greater scrutiny prior to export, more typical works can be freely traded. As Davidson noted, when overly restrictive rules govern export, enthusiasm for the art as a whole wanes. The amendments are expected to be a boon not only for collectors, but also for indigenous artisans whose work may be sold and exported without hindrance. 5.1 This Part lists objects of the category “Objects of fine or decorative art”. (ii) is at least 30 years old. 5.3 An object mentioned in column 1 of an item in the following table that has a current Australian market value of at least the amount mentioned in column 2 of the item is a Class A object. 5.4 Objects in this category, other than objects mentioned in clause 5.3, are Class B objects and include an object mentioned in column 1 of an item in the following table that has a current Australian market value of at least the amount mentioned in column 2 of the item. 5.5 However, an object is not in this category if it is owned by the person who created the object.